The Atlas Foundation is a secret society that considers itself the legacy of Genghis Khan, and has historically exercised its power in an attempt to dominate the world. But under the control of the latest to inherit control of Atlas, Jimmy Woo, the foundation is secretly a force for good in the world. Its model number and name are #005 / Jimmy Woo. -you may add or subtract 2 from the roll whenever the 20-sided die is rolled for a special power on the Army Card of a Unique Agent Hero you control. -after revealing an Order Marker on this Army Card and either taking a turn with Jimmy Woo or using Agent Field Leadership, you may use Agent Field Leadership one additional time. After revealing an Order Marker on this card and instead of taking a turn with Jimmy Woo, you may take a turn with any Unique Agent Hero you control that is within 6 clear sight spaces of Jimmy Woo. Bio - Long-time S.H.I.E.L.D. agent Jimmy Woo served from the '50s, when he fought against the evil Yellow Claw, right up until the modern-day. He was mysteriously restored to a more youthful age while investigating the criminal organization known as the Atlas Foundation. Around that same time, many of his allies from the '50s began to reappear in his life, drawn together by a yet-unknown puppet-master. The man pulling the strings turned out to be none other than Yellow Claw himself. Yellow Claw revealed his true name to be Golden Claw, and that he was head of the Atlas Foundation, which was itself the modern legacy of the Mongol Empire. Woo was Golden Claw's chosen successor to lead Atlas. Woo accepted the offer and took the reins of the Atlas foundation, but in order to use its influence for good. 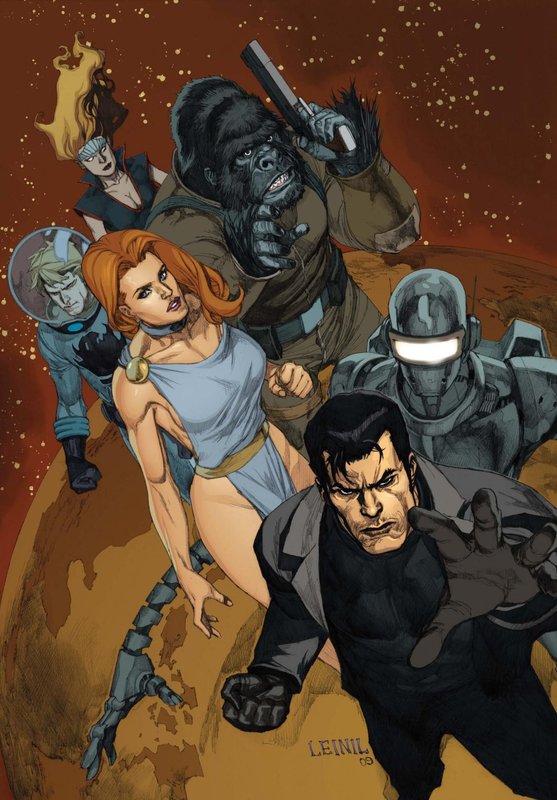 He leads the Agents of Atlas: Gorilla-Man, Namora, M-11, Venus, and Marvel Boy (aka The Uranian). Notes - Anybody out there who hasn't read Agents of Atlas (probably most of you) should give it some serious thought. Goes pretty quickly on Marvel Unlimited, and it's gold, like pretty much all of Jeff Parker's Marvel work. I've kicked around a lot of different ideas for how to tackle the Agents of Atlas as a group. Working around the long-finalized Gorilla-Man (who's been waiting an awful long time for Jimmy to team up with) has lead me here. Planning on doing more d20 powers for the rest of the gang. While there is at least one revealed Order Marker on this card, all Unique Hero Agents you control never take leaving engagement attacks and can move through all figures. Instead of attacking with Jimmy Woo, you may move up to 2 other unengaged Agents you control up to 4 spaces each. When attacking an adjacent figure with a normal attack, Jimmy Woo adds 1 automatic skull to whatever is rolled. When rolling defense against a normal attack from an adjacent figure, Jimmy Woo adds 1 automatic shield to whatever is rolled and all excess shields count as unblockable hits on the attacking figure. Its model number and name are #024 / Namora. When a Unique Hero or Atlantean figure you control is destroyed, add 2 dice to Namora's normal attack for the remainder of the round. You cannot add more than 2 dice to her normal attack with this special power. While on a water space, Namora may not be targeted by a non-adjacent attack, and you may add 2 dice to her defense. 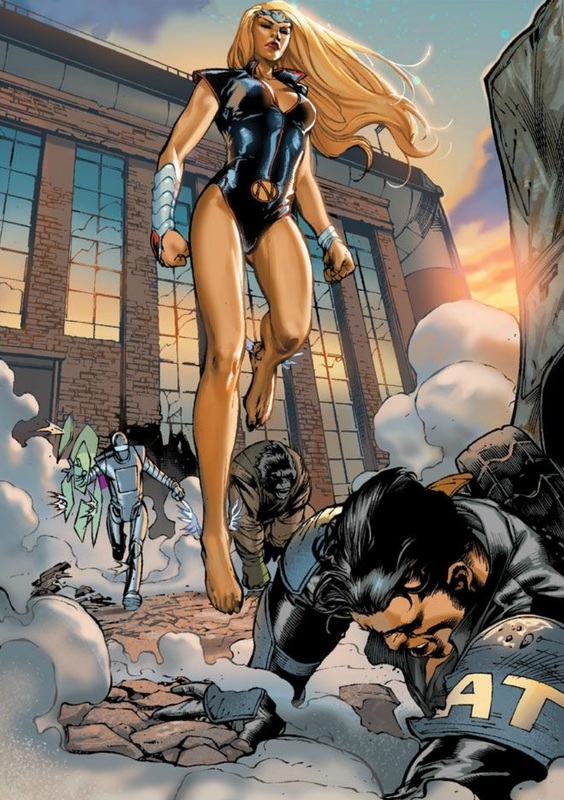 Bio - Like her adoptive cousin Namor, Namora is a human-Atlantean hybrid. She followed in her cousin's footsteps and became a hero during the 1940s and '50s. Though believed dead for decades, M-11 and the Agents of Atlas discovered that she had survived into the modern era, in a comatose state. They reawakened her and she joined the Agents of Atlas. Notes - I've been trying to go streamlined on the Agents of Atlas and keep them to two-power cards where possible, but I could see wanting a little more to spice up the design. Haven't had any solid ideas, though, and I really like her as a simple design at the intersection of a couple different synergy webs. Atlantean Empathy is a re-use off Wonder Girl - somehow we don't have any generic Atlanteans yet, but it'll pick up some usefulness when we solve that problem. Namora rolls 1 fewer Attack and Defense die for each Wound Marker on this card. After taking a turn with Namora, if she is not on a water space, roll 1 unblockable attack die against her. Whenever Namora ends her move on a water space, instead of attacking you may remove up to 2 Wound Markers from this card. Its model number and name are #052 / Venus. At the beginning of any figure's turn, you may reveal an 'X' Order Marker on this card. While there is a revealed 'X' Order Marker on this card, all Common and Unique figures within 2 spaces of Venus subtract 2 from their Attack numbers. If Venus or a figure within 2 spaces of Venus receives one or more wounds, remove a revealed 'X' Order Marker from this card, if possible. Androids, Constructs, Undead, and friendly Agents are not affected by Siren's Song. Venus does not have to stop her movement when entering a water space, and does not take leaving engagement attacks when moving onto or off of a water space. Bio - Venus was once a mere naiad that lured sailors to their deaths. That existence came to an end when she attempted to woo the Ancient One, who cursed her to have a soul as beautiful as her physical form. Distraught at the blood she'd shed over the years, she stopped killing and began to wander the Earth. She eventually repressed entirely the memories of her former life and came to believe she was the love goddess, Venus. She was recruited into the Agents of Atlas by Jimmy Woo and came to terms with her true nature and history. She frequently uses her siren abilities to de-escalate tense situations, and has even earned the respect of the real Venus, who allowed her to keep using the name. Notes - Hard to get the balance/theme just right on this kind of thing, but here's a spin at it. After moving and instead of attacking, you may choose a figure and roll the 20-sided die. If you roll a 9 or higher, you may move that figure up to 4 spaces. Figures moved by Siren Song will take any leaving engagement attacks. If Venus or any Agent within 4 clear sight spaces of Venus is targeted for an attack, you may roll the 20-sided die. If you roll a 1-4, all figures within 4 spaces receive a wound. If you roll 5-15, nothing happens. If you roll a 16 or higher, the opponent's turn immediately ends. Summary: a human with superpowers as a result of being raised among the Uranian Eternals. In the 50s he adventured as Marvel Boy, but in the modern day his powers have further evolved after continued life on Uranus, and he goes by 'Uranian'. After revealing an Order Marker on the Army Card of a Unique Hero Agent you control, instead of taking a turn with that Hero you may take a turn with any other Unique Hero Agent you control. The Uranian's class is also Telepath. When rolling defense dice against an attack from a figure who is not a Telepath, The Uranian always adds 1 automatic shield to whatever is rolled. Once per round, when The Uranian moves with his Flying Special Power, you may add 5 to his Move Number. After moving with Flying Saucer, you may choose up to 3 friendly figures The Uranian passed over and place them on empty spaces adjacent to The Uranian. Figures placed by Flying Saucer will receive any leaving engagement attacks. Summary: terrorist mastermind, former head of the Atlas Foundation that set up Jimmy Woo to take control of Atlas. Summary: great-great-grand-niece of the Golden Claw, former love interest of Jimmy Woo, terrorist mastermind, antagonist to the Atlas Foundation after Jimmy inherits it. Mini: No, but might be able to mod something out of a Viper mini. Mini: No, but his look is pretty straightforward. Summary: the son of the Mandarin and an expert martial artist. He's clashed with Iron Man and was recruited into the Atlas Foundation by Mister Lao in order to preserve a more aggressive element. Last edited by Ronin; January 20th, 2019 at 11:00 PM. I tried to include a little info about all the undesigned characters, just in case anyone got interested in one of them. Also, the notes that go with my designs are old (and go back to whenever I wrote them up). I honestly didn’t remember any of those. My write ups definitely look like they’re aiming for a higher point level than Ronin’s. I do like some of the stuff I have, but I like Ronin’s “streamlined, cheaper” take a little more I think. Yeah, I kinda like keeping them streamlined since they're Golden Agers (or near to). I do like that you have Death Ray called out on M-11's card - that was something that I really reluctantly cut from my first draft. I’m going to try and read some of the Agents of Atlas stuff this week and see if I’m inspired. I might try at either of the Claws or Lao, as they sound like my kind of thing mechically. Awesome! Lao definitely has room to be a really cool design. I think I've already said this in your thread, Ronin, but I really like what you've got for the Agents of Atlas - they look like fun! One question, though, since it's kind of the kick I'm on right now, but does Woo have a specific fighting style that could give him a more specific power than CCE? No problem if not, but I like the idea of conveying specific fighting styles where we can. Fair enough - it's just that if he did have anything more specific, people are saying that few enough comic 'martial artists' have a definable fighting style that I pretty much don't ever want to miss an opportunity for greater differentiation. If this guy isn't one, that's fine, his card's cool enough already, and CCE is more interesting on a ranged figure anyway. Might roll this thread out into the public, just to see if anything catches anyone's interest. Don't think there's anything spoilery in here.